"Swing Dancing" is a broad term that applies to a lot of different dance styles. Discover the wide variety of movement that jazz music has to offer. Invented in 1927, lindy hop (or "lindy") is the most popular style of swing dance. Typically danced with 6 and 8-count movements, lindy hop is low, bouncy, and energetic. You'll find unique movements of all numbers and counts, lindy hop is a melting pot of dance styles with Charleston, blues, and solo jazz influences. Acrobatic tosses and throws—called aerials or “air-steps”—are often highlights of performance and competition dancing. Originating in the late 20’s/early 30’s in Southern California, balboa was originally developed for crowded dance floors, emphasizing a close embrace, front-of-body connection, and fancy, shuffling footwork. Over the years lindy hop inspired a more open style, called "bal-swing." Today, dancers use a mix of traditional balboa (known as “pure bal”) and bal-swing patterns to shape and expand balboa on the social dance floor. One of the most iconic dances of the last century, The Charleston is characterized by high flying legs, rhythmic kicks, and a wild energy that practically defined the "Roaring 20's." Women who danced charleston were nicknamed "Flappers" because of the way they flapped their arms and strutted like birds. The Charleston transformed dancing from a simple social activity to a dance style that's equal parts performance and spectacle. Charleston is a partner dance, but can also be performed solo. Solo Jazz is a blanket term for "un-partnered dancing" that uses improvisation within a framework of traditional dance steps performed to Swing Era music. Solo jazz is an energetic dance style that focuses on syncopated rhythms and variations on basic patterns. Solo jazz dancers borrow a lot of individual steps from Charleston flappers, jazz performers, and tap dancers of the early swing era. A number of choreographed line dances are popular among modern lindy hoppers. 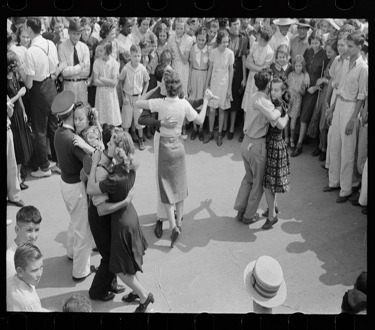 Dance bands in the ’20s, ’30s, and ’40s, commonly played a wide variety of tempos—including slow sultry music at after-hours “rent parties.” Blues dancing easily mixes and matches with other techniques and often looks like tango with small movements and subtle connection between leader and follower. Often called "Ballroomin’" or "Drag Blues," blues dancing is an eclectic collection of moves, styles, and tempo. Originally created in the 1930's shag dancing borrows a lot of the look and close frame from balboa. Perfect for crowded dance floors and energetic music, shag is danced to fast music (180 bpm and above). Shag is unique because “trucking,” or breaking away from your partner and traveling all over the floor, is big part of the dance, along with crazy-legged footwork, flourishes, kicks, and a number of silly variations. Unsurprisingly developed in St. Louis, Missouri, St. Louis Shag originated in the 1930s. Most likely descended from the Charleston, this dance features an 8-count basic comprised of kicks, stomps, and triple steps. St. Louis Shag can be danced alone or mixed into a dance with lindy hop steps.